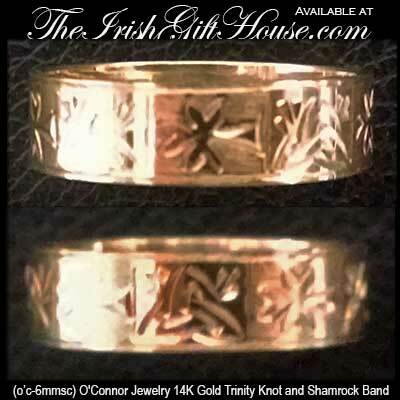 This 14K Gold Men's Celtic Wedding Band features alternating engraved Celtic Trinity Knots and Shamrocks that are continuous around the 6mm wide band. 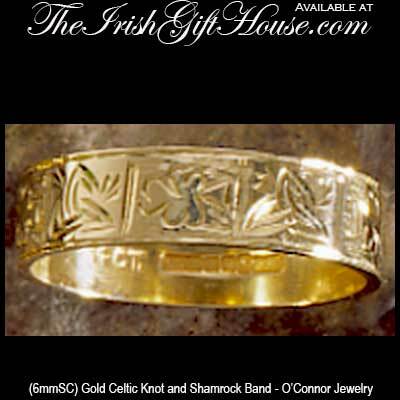 This Celtic Wedding Band for men is gift boxed with the Celtic Knot and the Shamrock history and was made in Ireland by James O’Connor Jewelry in Dublin. This gold Celtic ring has been hall marked by the Irish Assay Office at Dublin Castle.